Today, he is a priest from India serving temporarily in Bismarck, North Dakota, but then, he was visiting Lourdes with his father David, mother Baby, and ten-year-old brother Fausty. They were on a world tour, traveling from their temporary home in, Sultanate of Oman, in the Middle East where his father was an international banker and the boys attended a private school. The family walked through town, headed to the spring-fed baths to take their turn among pilgrims to be dipped into the waters where miracles sometime happen. The only thing Father Christy recalls at the time, however, is spotting an ice cream parlor and pulling on his mother’s sari. “Can I have ice cream?” he asked. It was a silly request. Ice cream could send him to the hospital. Before he was too young to even remember, Christy went into a sudden seizure that would not quit. He ended up in the intensive care unit, unconscious, and unresponsive for twelve hours. The doctor believed that he was unlikely to survive and if he did, would be abnormal or paralyzed. Christy’s parents prayed hard and suddenly the medicine started working. But after his recovery, sudden temperature changes—even just standing in front of a fan—would send him back to the hospital with a high fever needing to be packed in ice to bring it back down. Eating ice cream was simply not an option for him. 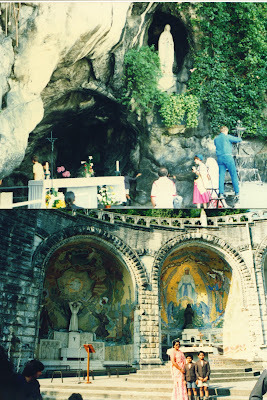 Father Christy said his take-away was: “I’m going to get ice cream!” He does not recall thinking about the story of St. Bernadette Soubirous, a poor girl to whom the Blessed Mother first appeared on Feb. 11, 1858 in a cave on the banks of the Gave River in Lourdes. The visions continued for several weeks. After the first two weeks, a spring emerged, and the waters were miraculously healing people. On March 25, the woman in the visions told Bernadette that she was "the Immaculate Conception" and that a chapel should be built on the site of the apparitions. 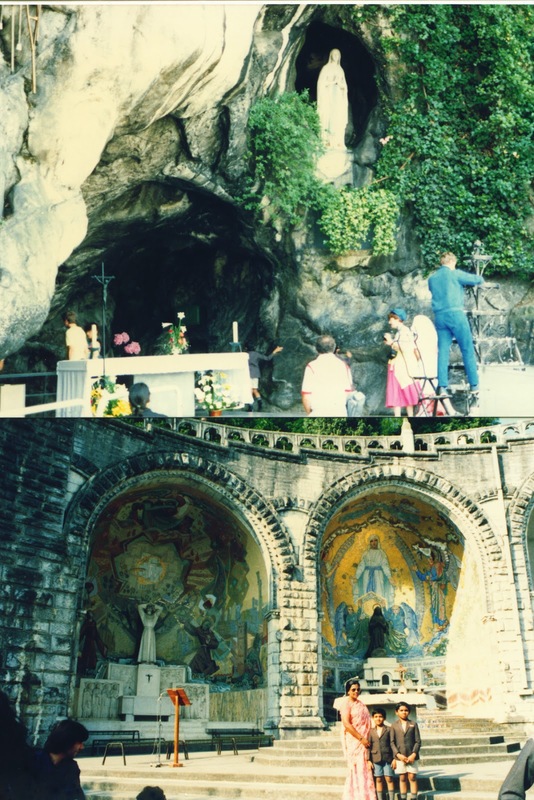 Today, six million visitors come annually to see the grotto and dip in the spring. Many miracles are still claimed to take place. When they got to the baths, just ahead of him was a lady with a severely handicapped son in a wheel chair. After Christy came out of the water and stepped back outside with his dad and brother (waiting for Baby), the lady with the handicapped son, walked over to him. “She handed me five francs and said, ‘Go have your ice cream.’” he said. “She gave my brother a coin too and then spoke to my father for some time. As she was leaving, she asked me to pray for her son.” Father Christy said he later wondered if the woman was the Blessed Mother and if her son was Jesus. “Chocolate,” Christy ordered at the counter. But that flavor was 15 francs, so his dad paid for it with other money. His mother kept those two coins and has them in a special pouch to this day. Christy did not get sick from the cold that day or ever again. He was healed! It was a monumental trip in many ways. In addition, the family got to meet the now Saint Pope John Paul II who actually hugged the boys, and also Mother Teresa. They had gone to the Sisters of Charity convent to see an aunt who belonged to the order. 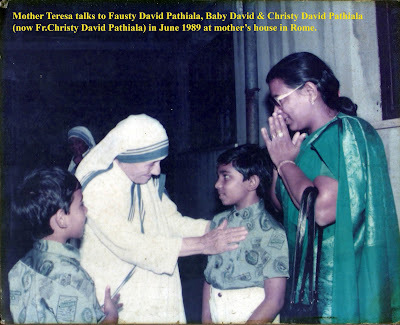 It turned out that she was not there, but Mother Teresa was. 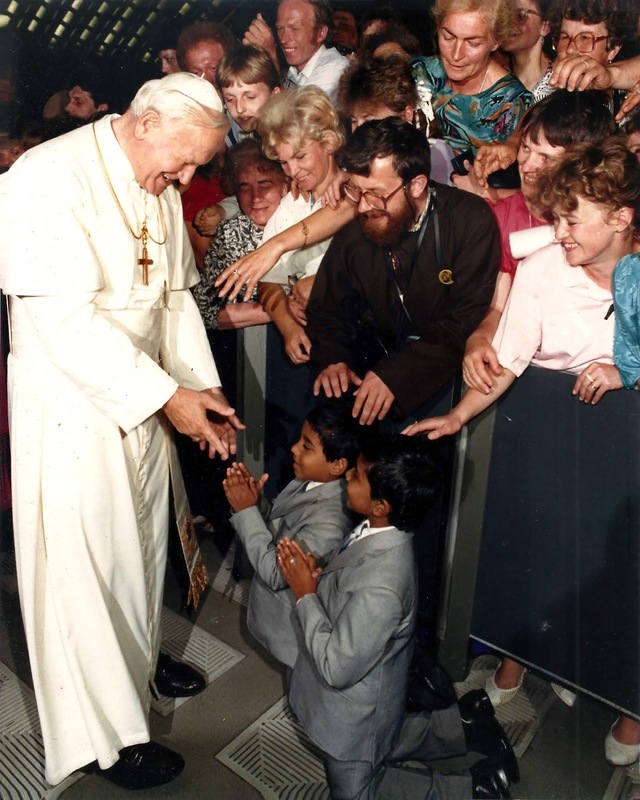 It was during that trip in 1989, that Father Christy felt the first glimmer that perhaps God was calling him to the priesthood. He also developed a closed relationship with the Blessed Mother which continues today. The family moved back to India seven years later and in 2010, Father Christy was ordained A priest. In the whole of India, only 1.55% are Catholic, just under 80% of the country is Hindu and 14% Muslim and 2.3% Christian (which includes Catholics). In his home state of Keralite in Southern India, 19% are Christian and of those, 55% are Catholic. According to tradition, Catholicism arrived through St. Thomas the Apostle who came to Muziris on the Kerala coast in 50 AD, which is in present-day Pattanam, Kerala. The Cochin Jews are known to have existed in Kerala in the 1st century AD, and it was possible for an Aramaic-speaking Jew, such as St. Thomas from Galilee, to make a trip to Kerala then. Father Christy arrived in Bismarck in August of 2017 on sabbatical from his position as the Vice Chairman of St. Albert's College to get a master’s in business administration at the University of Mary working toward a doctorate in computer science, then returning to India in 2023. He served at the Cathedral of the Holy Spirit during his first year here and is now at St. Mary’s Church.